This excellent interior image is of a card posted way back in October 1903. The details of the magnificent screen are clearly shown. The postcard of the exterior south side of the church was never posted. 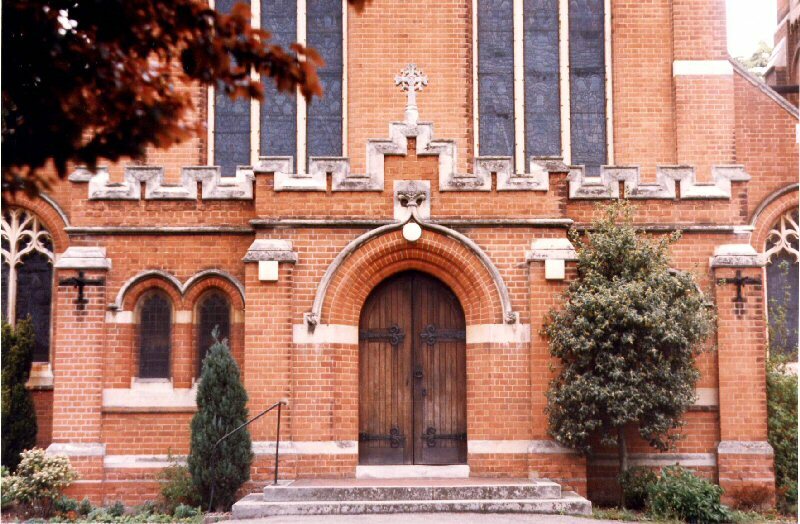 In the church of St. Peter, Staines, some 18 miles west of Central London, can be seen an example of Fellowes Prynne’s work at its most successful. For a start, the site is perfect: an expanse of land in which the architect could express himself freely, with the added artistic bonus of a riverside location. The building overlooks the River Thames with no obstruction other than its own attractive lych gate. 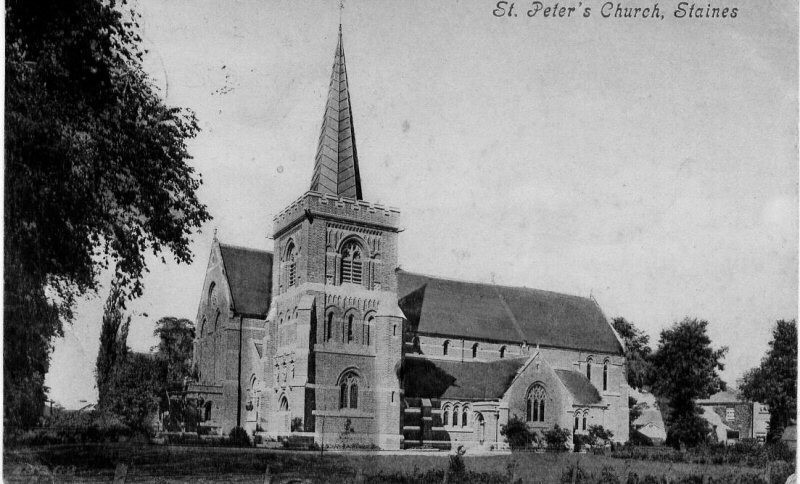 Furthermore, the munificence of the benefactor, Sir Edward Clarke, Q.C., ensured that a building of the highest quality could be achieved, and St. Peter’s is one of the few churches completed almost exactly to the original plan. 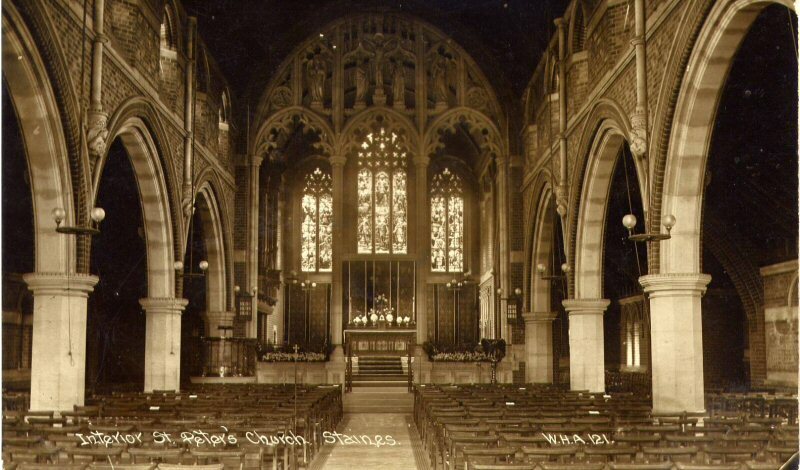 George Fellowes Prynne said of this church that he had never been more satisfied with the building, work, sculpture or anything else connected with a place designed by him. Messrs. Goddard & Son of Farnham were the builders, and the sculptor was Mr. J. Taylorson of Lavender Hill, London. The style chosen in design is a free treatment of perpendicular in red brick and stone. The nave is of four bays, twenty six feet wide by eighty feet in length having a height of forty feet to the apex of the waggon roof. The chancel is of the same width and height as the nave. There is a narthex at the west end with western entrance. 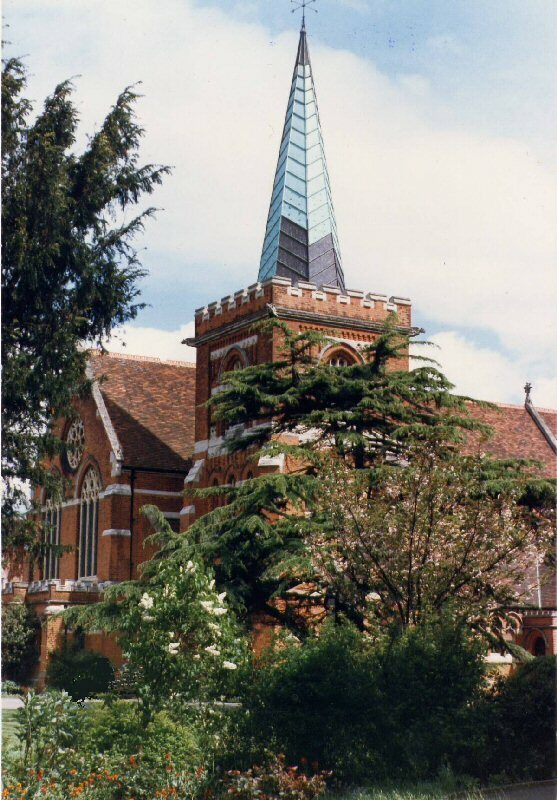 The tower, which is placed at the south-west end of the south aisle is designed in three stages, and capped with a copper covered spire. In the lower stage on the nave floor level a baptistery is formed. A southern transept with separate entrance forms the nave of a small chapel on the south side of the chancel. On the north side of the chancel are clergy and choir vestries with the organ choir. The altar is elevated by nine steps from the nave floor level, and ample space and height is left above and behind the altar for a baldechin or reredos. One of the main features of the church is the constructional rood screen, which is carried right up into the chancel arch, the portion of which is enriched with tracery. The central figure and rood are designed to be cut out of the solid stonework of the tracery, and the side figures placed on corbels formed in the panels of the tracery. This feature is quite unique, no other example of similar treatment existing. 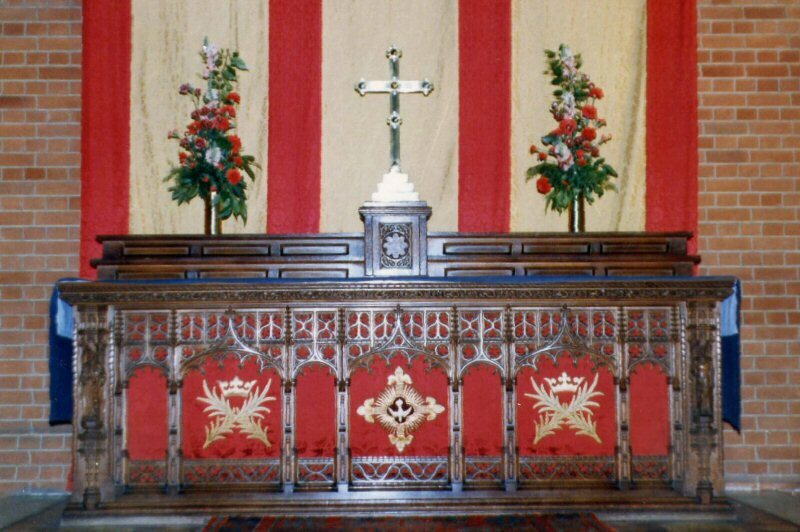 The furniture of the church is of an appropriate and ornate character. Choir stalls have been presented by Sir Edward, and the altar, which is of very elaborate design and highly decorated in gold colours, is a gift of Lady Clarke. This building is one of the architect's master works. Further information on the exterior and interior detail, including the stained glass, can be obtained by contacting me.